Biology students at The Sixth Form College, Solihull got a crash course in DNA this week, when they completed some advanced genetics lab work. Staff from The Science Team visited the College to deliver the DNA masterclass. Students extracted their own DNA from cheek cells and used university level equipment like micropipettes, centrifuges and a PCR machine to analyse that DNA. The masterclass taught our first year A level students complex Biology theory, much of which will be expanded upon when they get into their second year of study. 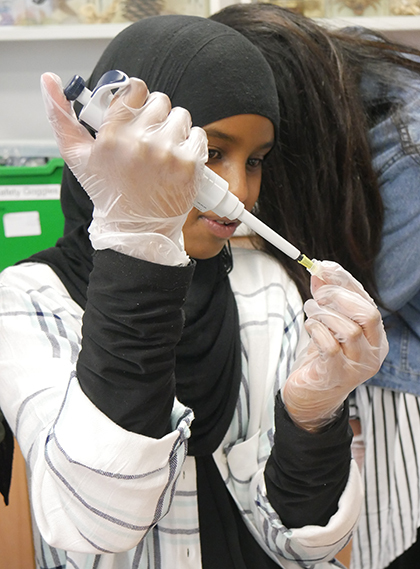 It gave the students a basic understanding of the make-up of our DNA and the process that scientists have to go through to break that DNA down to replicate it for analysis. They discovered that our DNA is more closely related to the DNA of many other organisms than they might have realised. This masterclass follows hot on the heels of a series of workshops at the University of Wolverhampton, covering topics like epigenetics and genetic transformations. See more photos of this masterclass on our Facebook page.